Appointments of Latino political activists were limited in the United States at this time. Otreo’s rise likely reflected his family ties. His uncle, Solomon Luna, was one of the richest people in New Mexico and a longtime member of the National Republican Committee. This was a time when 70 percent of the state’s Latinos, who largely identified as Spanish Americans, registered with the party of Abraham Lincoln. 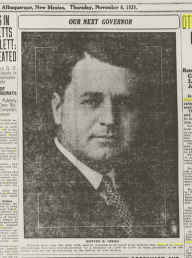 The state Republican Party formally nominated Otero for governor in September 1924. Voters responded enthusiastically to the campaign, as did a number of newspapers. The Albuquerque Morning Journal declared Manuel B. Otero the victor shortly after the election. The alleged shenanigans in counting and reporting the ballots led Otero to charge that he had lost due to voter fraud. Otero filed charges to overturn the election results, but he ultimately dropped what might have proven to be drawn-out and costly litigation. He remained active in politics but never again ran for governor. This entry was posted in Activist Profiles, Southwest and tagged Republicans. Bookmark the permalink.